Small country (less than 6 million people) without access to the sea, wedged between three giants (Vietnam, Thailand and China), Laos is a mountainous and rural poor and yet imbued with ancient traditions. Apart from Tourism in Luang Prabang, the former royal capital, is still in its infancy and is conducive to the discovery of a discreet and very friendly people. But this country is as fragile because of its poverty still present, the appetites of neighbors and the opening to tourism, the quiet life and culture of a country's precarious balance can be threatened. Laos is a beautiful country to discover. 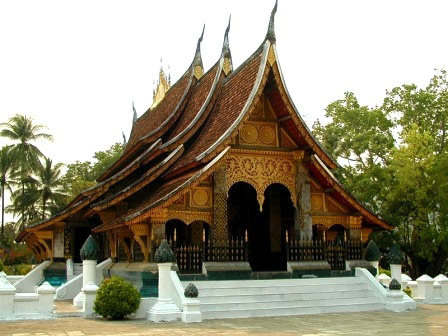 The city of Luang Prabang, rightly classified as a World Heritage Site by UNESCO, is by far the historical remains as the richest in remains from the past: ancient royal city, it is full of ornate temples in which monks and novices. Wrapped in their robes saffron, they are a "choice menu" for tourists eager to beautiful pictures. One of the traditions in Luang Prabang is the procession of the morning all the monks leave their monastery at dawn, barefoot and silent, dressed in orange and begging bowl in hand. They parade in the light of dawn to collect their daily food as their faithful devotees distribute, lined the streets on their knees as a sign of respect, putting his hand a portion of each offering. Unlike other countries, Laos seeks to encourage eco-tourism projects. Many rural areas, forestry for the most part, are now classified and protected to maintain the landscape, flora unique (multiple pockets of primary forest) and fauna. In recent years, alternative agencies have created and offer visitors tours sports (hiking, mountain biking, etc...) That allows discovery of these fabulous sites, meet the locals while limiting the impact on the environment and supporting development projects at local level. Authenticity Guarantee and unforgettable encounters! You can stay in the village, cross the breathtaking scenery, participate in the games children learn to cook some delicious Lao cuisine specialties ... These experiences are suited to many types of travelers for 1 day, 2 days 3 days or more within their sports versions, levels of difficulty. Laos is one of those countries that you change ... With a little patience, respect and sense of observation, you will come back with happy memories, memories of emotional events and a desire: to go back! I am a Professional Blogger and a Teacher. I have been writing professionally for more than five years. I enjoy reading and blogging.